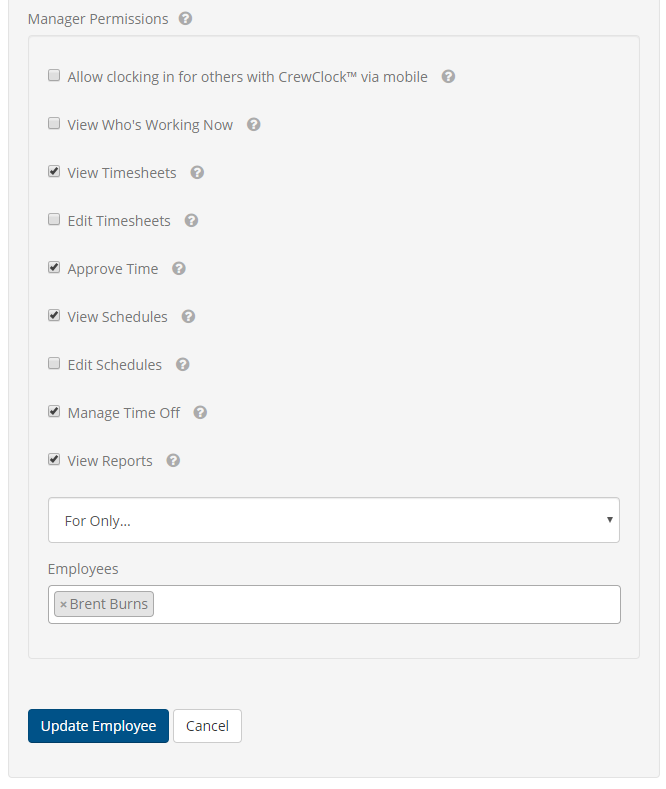 Using the Role setting and Manager Permissions settings for Employees you can easily control access for each Employee using ClockShark to limit access to specific features. You can also limit access for the chosen features to a specific list of Employees, or specific Departments or Locations. This makes it easy to setup multiple business Locations or Departments within a single ClockShark account. For each of your business Locations or Departments you can setup different employees who have access to those specific employees. This limited access will ensure the employees in charge of managing a specific part of your business aren't distracted by seeing employees from other parts of the business they don't manage, nor do they have access to view or edit their time sheets or schedules. 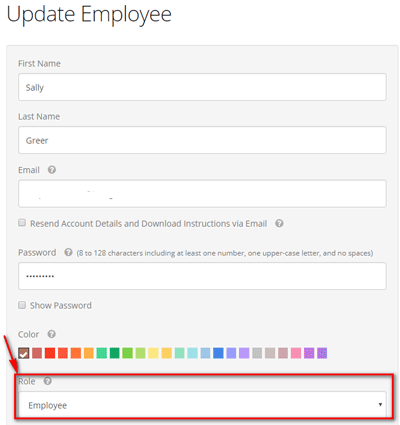 To change the Role for an Employee visit the Employees screen and edit the Employee. Roles can also be set while initially adding an Employee. Administrator role users have access to ALL system features and are able to do so for ALL Employees. This access includes adding or removing employees, billing, viewing and editing time sheets, creating schedules, as well as clocking time for themselves (although not all administrators will clock time for themselves, nor do they need to). The Administrator role user will have access to all Employees regardless of an Employee's assigned Department or Location. Employee role users will only be able to see their timesheets and schedules on the app and online, clock in on the app only by default, and any other manager permissions you give them as explained below. There are some more settings you can grant them outlined in this article. Manager permissions can be granted to any Employee role user. Doing so will allow the Employee access to specific management functions related to other Employees' time sheets and schedules. For example, you could allow Employee Ben Smith to view and edit time sheets for all employees in the Installation Department or allow Employee Mary Sullivan to View and Edit schedules and clock in via CrewClock on mobile for all Employees in the San Francisco Office. Note: If you only want them to edit their timesheets from the mobile app, then you will want to choose the setting "Allow Edits to Own Time and Creation of Manual Time Sheets via Mobile" listed above.